Golden Triangle Self Storage is a proud supporter of Break the Silence Against Domestic Violence. Everyone at San Diego Self Storage is proud to embark on the third year of our Community Giving Project, carrying on a tradition of giving back to San Diego. We love this project! San Diego Self Storage facilities span San Diego County from Temecula to Otay Mesa. We wanted to find a way for all 17 of our locations to develop meaningful ties to their local communities. We’ve given each site $500, which they may contribute to any organization they see fit. We’ve contributed to a variety of philanthropies, with charities benefiting children and animals at the top of the list. Our teams have also chosen to help fight cancer, contribute to local history and humanitarian efforts. 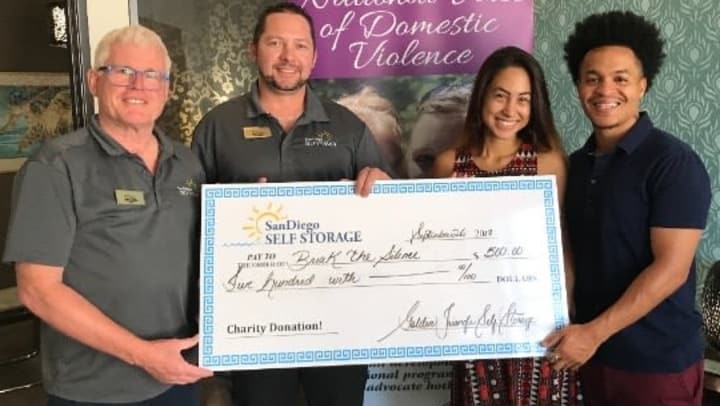 After careful consideration of several local charities, the team at Golden Triangle Self Storage opted to donate to Break the Silence Against Domestic Violence (BTS). While speaking with Founder, Kristen Paruginog, who is a survivor of domestic violence herself, the staff was impressed with how she has built the organization from the ground up. Kristen courageously shared her story of survival on social media in hopes to inspire other victims living in silence to break free. The outpouring of support from men and women was inspiring and sparked her desire to resign from her position in her career and make Break the Silence against Domestic Violence an official non-profit organization. BTS offers assistance and safety to victims of domestic violence. Through a variety of programs BTS fulfills their mission to educate communities on the dangers of domestic violence, connect victims and survivors, and assist them in the transformation of their lives – by providing a personal development retreat, scholarships, financial empowerment, and innovative awareness campaigns. BTS also provides a survivor’s helpline that is available Monday-Sunday. The office is just down the street from the GTSS facility, which further compelled our team to lend a helping hand to a neighbor. To learn more about Break The Silence, please visit the website. If you need help, please call the BTS Survivor Sister helpline at 855-BTS-1777 or you can call the National Domestic Violence Hotline at 1-800-787-3224.